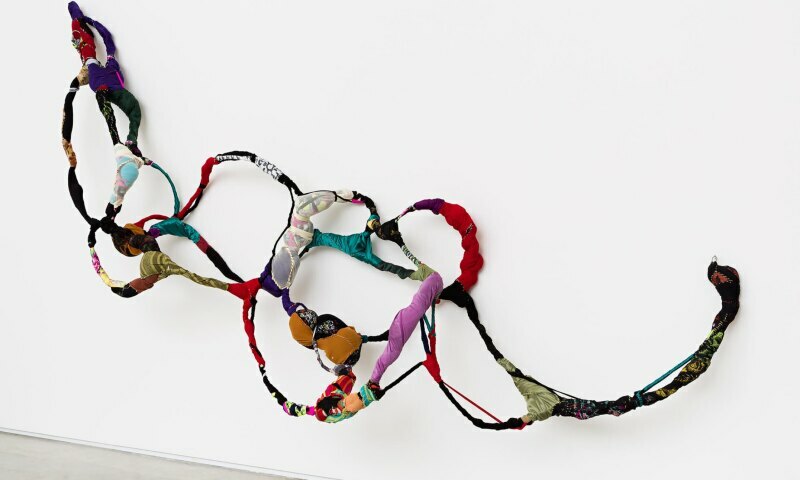 Sonia Gomes, untitled, from Torção series, 2015, sewing, moorings, different fabrics on wire, 430 × 120 × 50 cm. The sculptures and installations of Sonia Gomes (Caetanópolis, Minas Gerais, 1948) are made with residual materials, mainly textiles and various other objects. She constructs sculptures which involve or are made entirely of fabrics, often antique ones originating from her family’s collection. The city of Caetanópolis, Gomes’s birthplace, is an important center for textile manufacturing and the childhood of the artist was marked by the world of sewing and embroidery. Her visual production makes reference to artisanal Brazilian practices; the fastens, knots, amulets, bundles, and wefts which comprise her work recall the details of vestments found at popular festivals, such as the folia de reis and the congado—Afro-Brazilian cultural expressions—as well as the tradition of needle-women and lace-makers in the state of Minas Gerais, all of which were part of Gomes’s artistic formation.